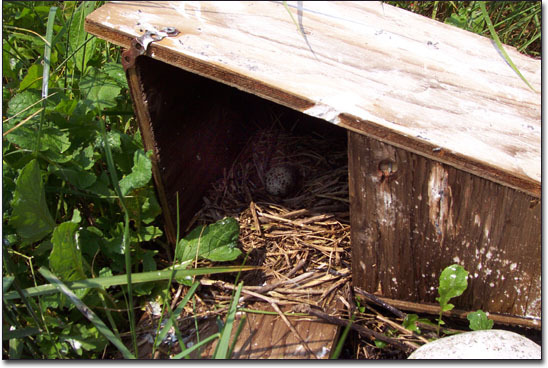 The following is a synopsis of the tern status in southwest Nova Scotia for the 2002 nesting season. 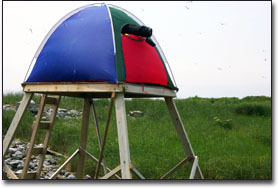 My "tern" work and observations deal primarily with the tern colony on The Brothers. These two tiny islands are located about 1 km offshore from Lower West Pubnico in Yarmouth County. 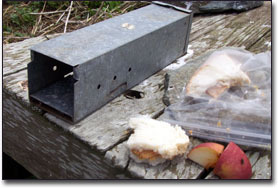 On May 5, 2002, I placed six new design Roseate Tern nest boxes on N. Brother, two on S. Brother and four on île-aux-fraises (a.k.a. Green Island to the south of Wedgeport). We also fixed up other nesting structures on the islands. 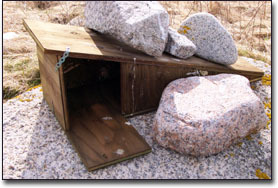 The "new design" boxes are wedge shaped with plywood roof and floor (see photos below), and I believe they were designed by Dr. Jeff Spendelow, wildlife biologist, Patuxent Wildlife Research Center. 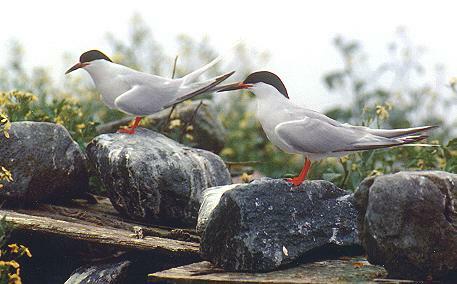 On The Brothers, the total tern nest number decreased slightly to 833, from 880 in 2001, and 491 in 2000. 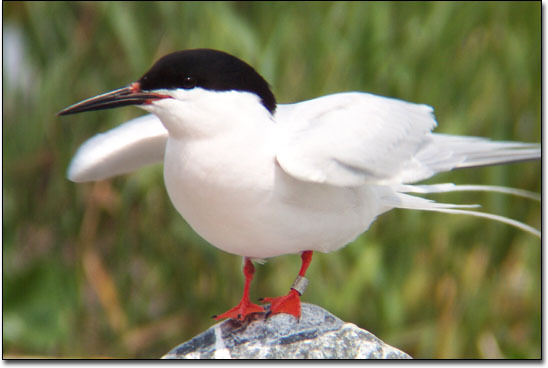 Île-aux-fraises had 364 tern nests on June 13. There were no Roseates there; 95% were Common Terns; the remainder, Arctics. The number of Roseate Tern nests on The Brothers went up to 90, from 70 in 2001, and the previous high count of 86 in 2000. A New Record! 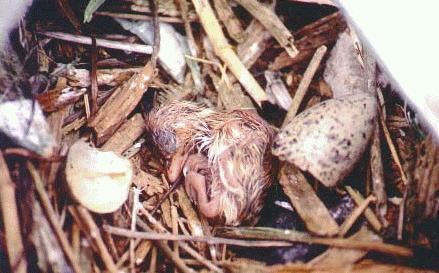 Roseate Tern chick survival appeared to be higher than on previous years. 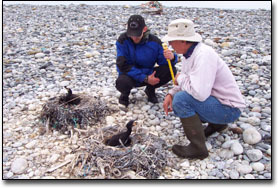 On July 3, 2002 Andrew Boyne, a species at risk biologist with Canadian Wildlife Service, and Jason Beukens, his apprentice, banded 36 Roseate Tern chicks on The Brothers. I have been informed that about two months after we banded the Roseate chicks on The Brothers, two of these birds were identified on Great Gull Island, New York. Amazing news! Of the 36 chicks banded on July 3, 13 of these were found again on July 13/14. The colony was in great shape! 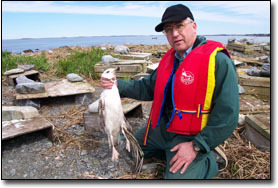 One Great Black-backed Gull's nest was removed from both South Brother and Île-aux-fraises. 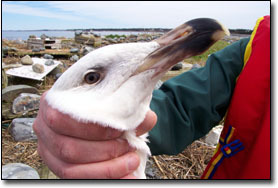 One cripple Herring Gull was removed from North Brother on May 22, 2002. 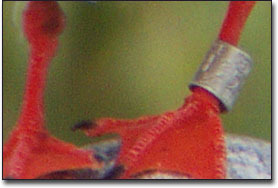 With the aid of a spotting scope and a blind I was able to identify several Roseate Terns by their leg bands. I informed Dr. Jeff Spendelow of the band characters. 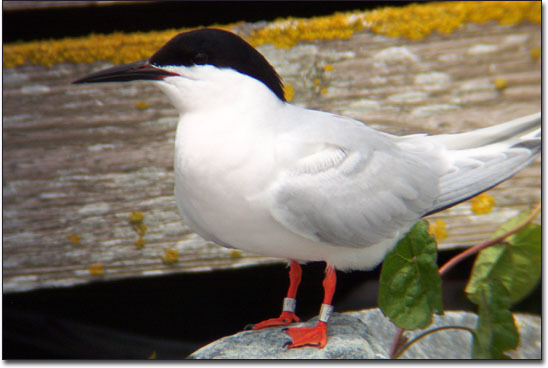 One tern had been banded as a chick on 6-24-96 at Bird Island, MA, another had been banded as a chick on 6-30-99 at Petit Manan NWR, ME, and a third had been banded as a chick on 6-23-95 at Petit Manan NWR, ME. The vegetation on South Brother was almost non-existant in May. Through trapping I was able to deternine the cause; a high population of Meadow Voles. This was new for this island. There are still no rodents on North Brother. The voles apparently presented no problem for the nesting terns. 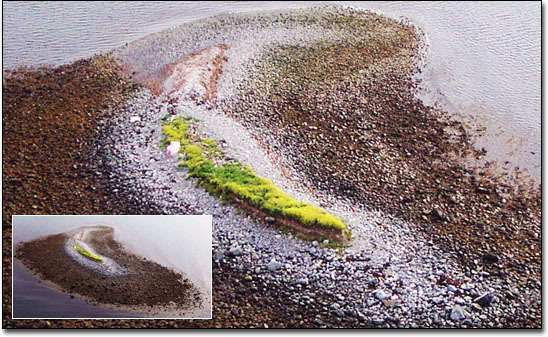 By June, South Brother was vegetated again. 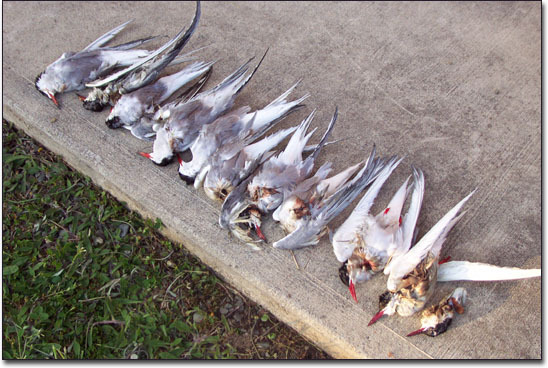 On June 13, about a dozen dead adult Common and Arctic Terns were collected from N. Brother. Some had been decapitated. Most were uneaten. Owl? One of the Common Terns had a broken bill. The carcasses were collected for Canadian Wildlife Service analysis. There were no other kills like this seen during the nesting season. 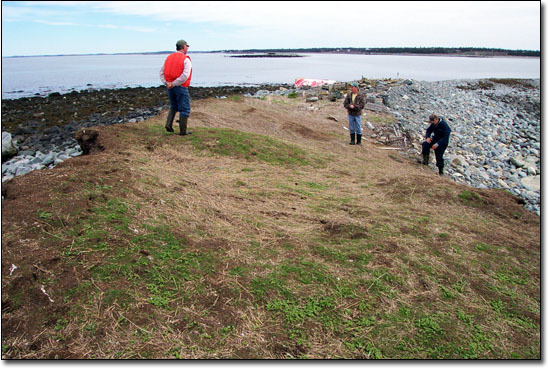 On June 18, with Grant Milroy and Sidney Smith, I checked out the Cape Sable area of Cape Sable Island for Roseate Terns as well as terns in general. Our first stop was to Salmon Island where there was a report of a massive Roseate Tern kill in 2001. We found no evidence of any terns there this season. 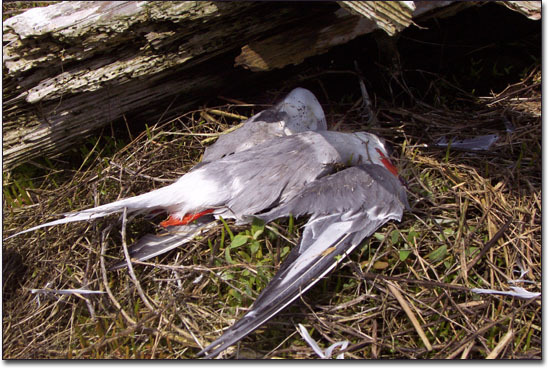 The kill of 2001 on Salmon I. proved out to be normal tern mortality, likely due to adverse weather conditions, and did not include any Roseates at all. The only tern colony we did find was on the Cape itself and consisted of about 40 Arctics and one or two Common Terns. As to nests, we found only one. It contained two eggs. 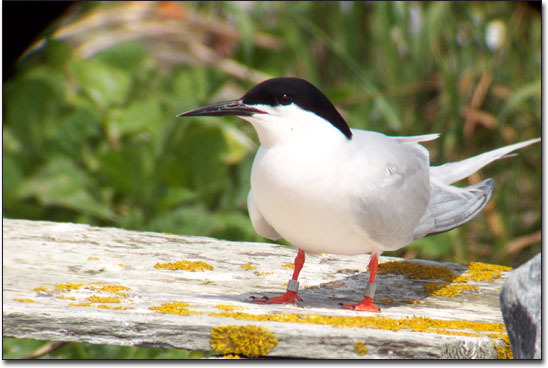 On June 29, we counted 31 Arctic Tern nests on Flat Island and two more on Round Island. No other tern species were seen there. 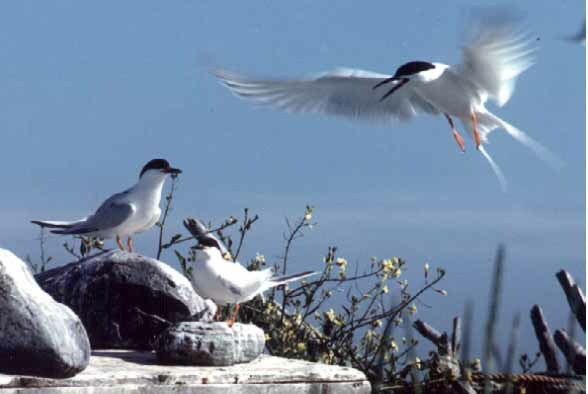 All in all, the 2002 tern nesting season on The Brothers was nothing less than phenomenal. The Best Year Ever! The most nests and the most chicks! The following is a chronological listing of my year 2002 work with terns in general, of the Lobster Bay area, but especially with the Roseate Terns of The Brothers. The report also includes tern observations from other local residents. April 20, 2002 - A quick visit to North Brother (N. Brother). Nothing much to report. One very young seal was washed up on the beach. 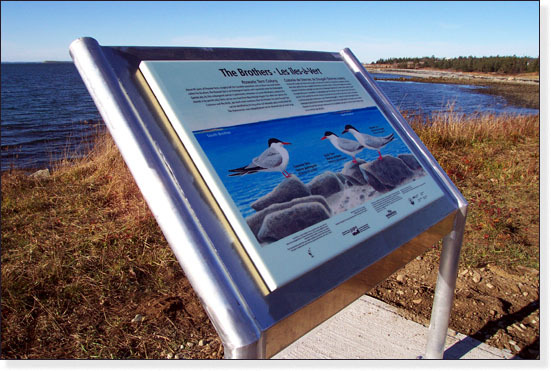 April 28, 2002 - The Important Bird Areas (IBA) Interpretive Panel - The Brothers' Roseate Tern Colony was officially unveiled in Lower West Pubnico. 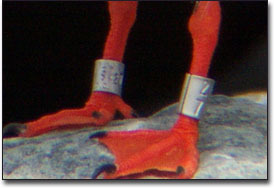 May 2, 2002 - The "terns" have arrived on The Brothers. A number of lobster fishermen telephoned me on the event. 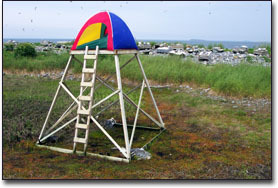 May 5, 2002 - Placed six new design Roseate Tern nest boxes on N. Brother, two on S. Brother and four on île-aux-fraises (a.k.a. Green Island to the south of Wedgeport). We also fixed up other nesting structures on the islands. Crew: Rémi d'Entremont, Israel d'Entremont, Lester D'Eon, Jerome D'Eon and Benjamin D'Eon. May 18, 2002 - About 20 Arctic Terns at Flat Island and about 25 Puffins at Noddy Island. Crew: Rémi d'Entremont, Alix d'Entremont and Israel d'Entremont. 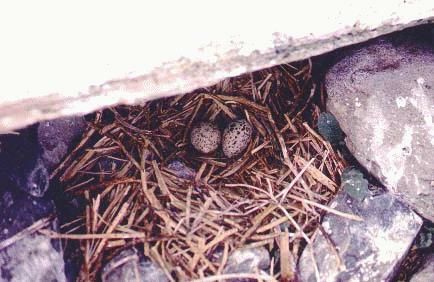 May 20, 2002 - 10 Common Tern nests were counted on île-aux-fraises. No signs of Roseate Terns were found. 5 nests contained one egg; the other 5, two eggs each. We aslo found one Common Eider nest on this island. One Great Black-backed Gull's nest was removed. South Brother - almost no vegetation! Every spring, the highest elevation of South Brother has a grassy area where one finds up to six Common Eider nests. This year the vegetation appears to have been nibbled away by what appears to be small rodents. I have always maintained that The Brothers were rodent free. It appears to be no more. Will the lack of vegetation benefit the terns, or will the rodents prey on the chicks? We will know within a couple of months. There were sone terns in the air above S. Brother, but no Roseates and no tern nests. I removed one Great Black-backed Gull's nest containing 3 eggs. No eider nests were found. On N. Brother, the vegetation was as usual for this time of year. Upon arriving, a cripple Hering Gull was caught and placed in a crate for later removal. We counted about 25 tern nests, mostly containing one egg. There were perhaps 150 terns on the air. Only a couple were identified as Roseates. There were a few Arctics also, though most were Common Terns. As we were preparing to leave N. Brother we could not locate the cripple gull. It had escaped from the crate. Crew: Rémi, Alix, and Franklyn d'Entremont. 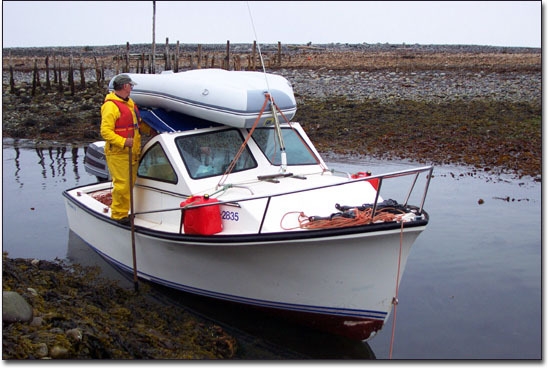 May 22, 2002 - I returned to N. Brother with Franklyn and Jean-Bernard d'Entremont, and Nils Jorgensen, to remove the gull. It was still there and easily captured. Nils was in West Pubnico visiting from Denmark. There were a few more tern nests that two days earlier, but still only a few Roseates were spotted. 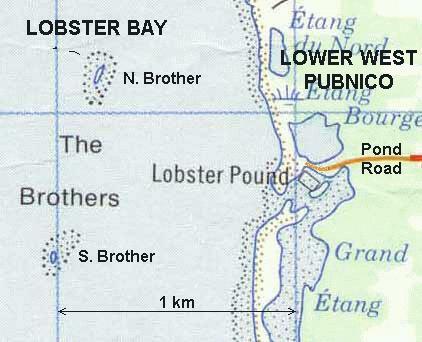 May 24, 2002 - The lobster fishermen are telling me there are as many terns as ever on The Brothers. This is good news! June 1, 2002 - Alix and I went to The Brothers to do a quick check. I estimated about 200 terns above N. Brother as we made our way to S. Brother. I was disappointed at the apparent small number. South Brother also had a small number of terns above it. I could only make out two Roseate Terns in the group. However, the number of tern nests was encouraging. We counted 100 tern nests, including one Roseate's. Also on S. Brother were two Common Eider nests. Then we motored to N. Brother. There we counted 568 tern nests, including about 30 Roseate Tern nests. None of the new nesting boxes contained a nest. One of these boxes contained some straw-like vegetation. The number of terns above these islands was not indicative of the nest numbers. I intend to do a more complete nest count in a week or 10 days. 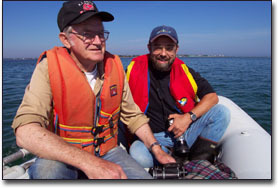 June 13, 2002 - After a couple of weeks of unsuitable weather for conducting nest counts, Israel d'Entremont and I set out to count the tern nests on The Brothers and île-aux-fraises. Great counts on all three islands. On South Brother we counted 178 tern nests including 13 Roseate Tern nests. A record for S. Brother! On North Brother we counted 655 tern nests, 64 of which were Roseate's. 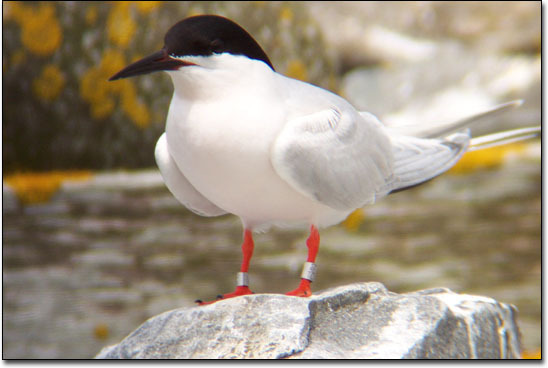 For a total, so far, of 77 Roseate Tern nests out of 833 nests! June 13, 2002 - Tern Nest Count on The Brothers. Only one of the new design Roseate Tern nesting boxes was being used. Its single egg appeared cold. No cripple gulls nor gull nests were found. 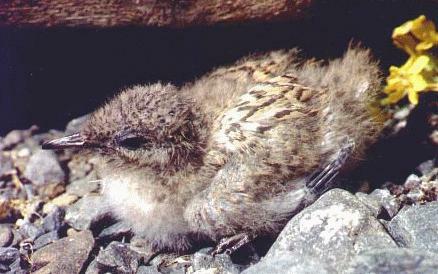 A small number of tern chicks were hatched and hatching. No Roseate eggs had hatched. About a dozen dead adult Common and Arctic Terns were collected from N. Brother. Some had been decapitated. Most were uneaten. Owl? Mink? One of the Common Terns had a broken bill. I have evidence that the small rodents on S. Brother are eating tern eggs or, at least, tern egg shells. An egg shell with definate gnawing edges was found in a rodent trail under a piece of wood. On île-aux-fraises (a.k.a. Green Island) we counted 364 tern nests. About 95% were Common Tern, the remainder, Arctic. There were no signs of Roseate Terns there. Several Common Eider nests were found. No gulls were nesting on the island. June 17, 2002 - Today, I brought Pauline and her husband, Melford (a.k.a. "Coton"), with me to The Brothers. The trap setup Pauline and "Coton"
On S. Brother, I set three live traps with peanut butter and apple to catch a sample of the rodents which have colonized the island. I suspect Meadow Vole. I will know for certain in a couple of days. One more Roseate Tern nest was found on each of The Brothers bringing the total Roseate Tern nest count to 79. There was no new evidence of tern depredation on N. Brother. It looks like the problem with the dead terns was likely due to owl rather than mink. I would have expected finding more carcasses on this visit, had a mink been on the island. 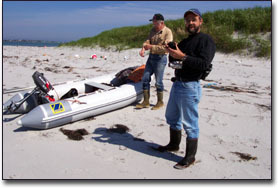 June 18, 2002 - With Grant Milroy and Sidney Smith, we checked out the Cape Sable area of Cape Sable Island for Roseate Terns as well as terns in general. 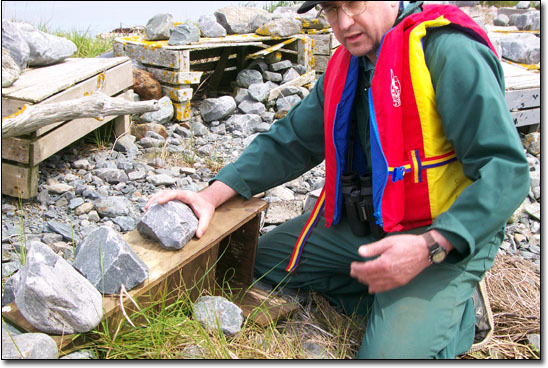 June 19, 2002 - On a return trip from Gannet Rock where we did see a couple of Arctic Terns with fish in bill, I stopped to S. Brother to check the traps. One of them contained a dead Meadow Vole. June 23, 2002 - I went alone to N. Brother to do a Roseate Tern chick count and check for leg bands. I located 59 Roseate Tern nests, including 3 which had not been identified before. This brings the total now to 83 on The Brothers. I suspect a few more Roseate Tern chicks and nests on South Brother. From the 59 nests, I documented 39 Roseate Tern chicks. One nest was empty and I did not find the chick. Two nests contained two chicks each. The chick ages ranged fron newly hatched to about 5 days (my estimates only). No dead Roseate Terns of any age were found. After the nest and chick count, I set up my my blind on top of the observation platform and checked out the birds with the spotting scope on loan from Canadian Wildlife Services (CWS). This blind, although very inexpensive, very portable and easy to install, is also very uncomfortable and cramped. I have built a plywood blind which bolts together and has the same base size as the observation platform. I know I have to get permission from CWS to place it on the platform permanently. It would certainly make observations much easier and more comfortable. Perhaps next year. At least 3 Roseate Terns were banded. One had both legs banded, one had a band on its right leg, and one had a band on its left leg. I managed to get the photos below by placing my digital camera to the eye piece of the scope and clicking. I was impressed by the clarity of some of the shots! The photos were all taken from within the blind. June 29, 2002 - Visit to Flat, Round and Noddy Islands. We counted 31 Arctic Tern nests on Flat Island and two more on Round Island. No other tern species were seen. There were two Gadwall nests on Flat Island. One contained 5 eggs, the other 12. It is always rare to see Gadwall in southwest Nova Scotia. We also saw two Green-winged Teals in the pond of Flat I. and a Black-crowned Night Heron flew away as we arrived. 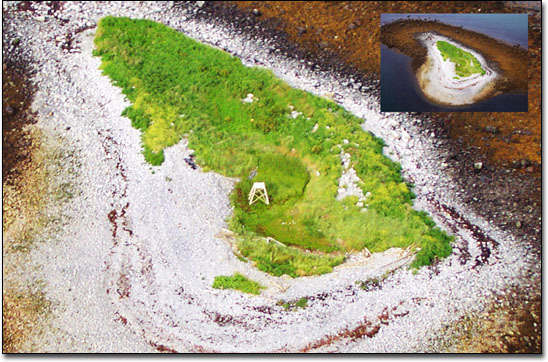 Ancient Cormorant nest mounds? Cormorant nests on Round I. On Round Island were 12 Double-crested Cormorant nests. This is the first time I have seen or heard of Cormorants nesting on this group of islands. 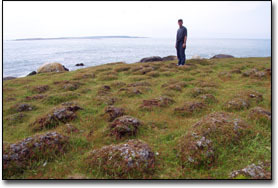 On Round and Mud Islands, there are areas of mounds of peat-like material which I have presumed to be ancient Cormorant nests. 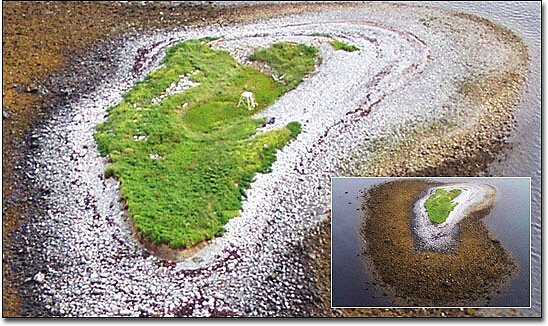 I believe they once nested on these islands in massive numbers, hundreds of years ago. We also saw 9 Puffins on the east side of Round I. One of these kept its distance under the boulders, beyond our reach. Black Guillemots, Leach's Storm Petrels and Common Eiders were also nesting there. We did not land on Noddy I. From the boat, we counted about 30 puffins. Most of them were in the usual southwest cove. However, there appeared to be some activity at the northeast side of the island also. 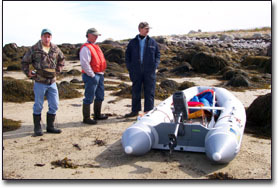 Crew: Rémi, Israel, and Raymond S. d'Entremont with Nigel and Andrew d'Eon. July 3, 2002 - Roseate Tern chick banding on The Brothers. It was a very foggy morning; the air temperature, about 20 Celcius. Andrew Boyne, a species at risk biologist with Canadian Wildlife Service, and Jason Beukens, his apprentice, arrived on The Brothers to do some chick leg-banding. Grant Milroy, of the Cape Sable Important Bird Areas committee, and my daughter, Ingrid, assisted us in the procedure. Grant had his digital camera clicking and shot some fantastic photos. 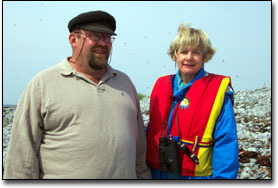 Ingrid was also there to write an article for Yarmouth newspaper, The Vanguard, on the banding of the Roseate Terns. To say the least, Roseate Tern chick success on The Brothers in 2002 is nothing but phenomenal, at least for The Brothers. 44 Roseate Tern chicks were located. from a total of 89 nests. Some eggs were still being incubated, so I expect a few more Roseate chicks. 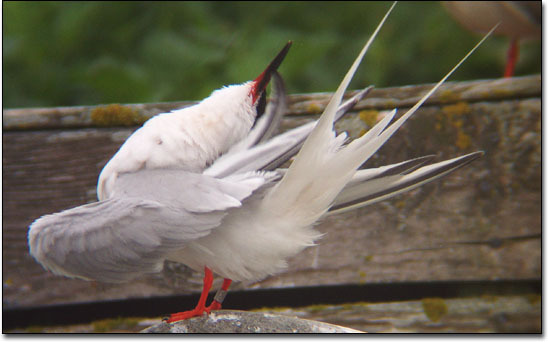 The success outlook for the Common Terns was not as encouraging. Mortality for the Commons was very high. Many carcasses littered the colony. I assume the recent cool and wet weather was likely the cause. July 4, 2002 - I went alone to N. Brother to some observation. Through the fog I read the field-readable from 3 Roseate Terns. A fourth Roseate carried a different leg band. July 13, 2002 - I went to S. Brother to see how the Roseate chicks were doing, and to see if any more of the chicks had hatched since July 3. Alix d'Entremont and Mr. Roger LeBlanc from Moncton accompanied me. We found two previously banded Roseate chicks and two unbanded chicks about 5 and 6 days old. There were also a couple of Roseate eggs still being incubated. The colony was very vibrant. 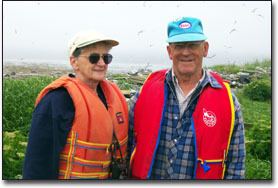 July 14, 2002 - Gisèle and her brother, Albert d'Entremont, joined me on N. Brother to do the Roseate Tern chick and nest census. Total Roseate Tern nest number, now at 90!